If you have any photos of Peregrine Falcons that you would like to contribute, please e-mail them to us with a caption and the photographer's name (but be aware that we must be selective of which photos we include because of space limitations for our website). Falcons belong to a group of birds known as raptors, or birds of prey. Other raptors include owls, hawks, eagles, and vultures. The majority of these birds share some basic characteristics, most notably that they have large strong feet and sharp talons for holding on to their prey, and sharp hooked bills for tearing at flesh. They also often have excellent eyesight, and most are highly skilled fliers. Falcons can be distinguished by their long, pointed wings, and their medium to long but generally narrow tails. As a result, they have quick and powerful wingbeats and are much more agile than other raptors, but on the other hand they cannot soar as well as species with broader wings. Falcons are also unique among raptors in that they have a notched beak (which looks like a little tooth on the upper mandible) that they use to help them sever the spinal column of their prey. 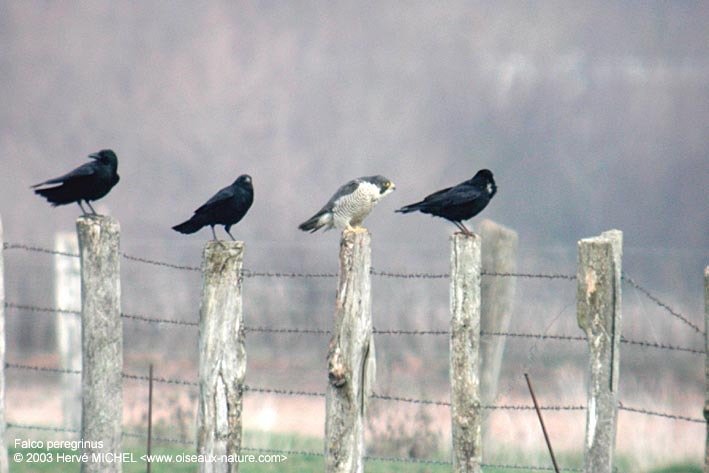 Behaviourally, falcons differ from other raptors in a few ways. Most notably, they do not build their own nests. Rather, they use tree cavities, rock ledges, or stick nests built by other raptors. Also, when excited, falcons typically bob their heads and pump their tails up and down. Other raptors may also move their tail when excited, but tend to wag it from side to side instead. Peregrines are large falcons, only slightly smaller than the common American Crow. As in most species of raptors, females are considerably larger than males. In the case of the Peregrine, the female is roughly 20% longer, and at least a third heavier than the male. Plumage differences between males and females are minor. Males tend to have a slightly whiter breast and somewhat fainter barring on the belly, while females often are slightly browner on the back. All Peregrines have a hooded appearance, with a dark crown and neck, as well as a moustache (malar stripe) of the same colour on the face. The size and shape of the moustache is slightly different on each Peregrine, and allows individuals to be identified much like fingerprints of humans. Peregrines are dark on the back, and usually have a light breast and a heavily barred belly. In flight, their dark underwing is often noticeable. Adults have bright yellow feet and a mostly yellow beak and eye-ring, while immatures have pale yellowish-gray feet and a bluish beak and eye-ring. Juveniles also generally have rather brownish plumage on their backs, in contrast to the adults which are gray or black. 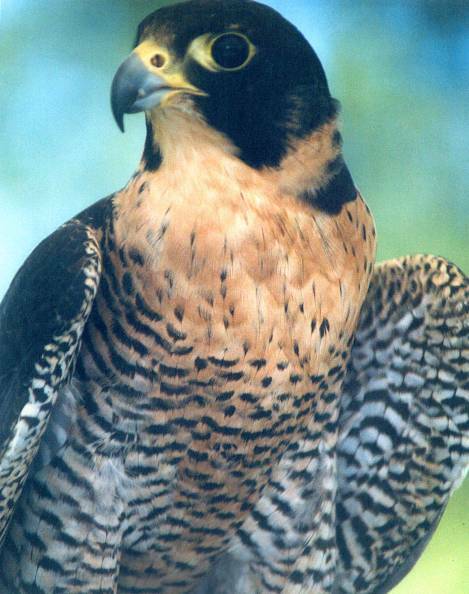 Worldwide scientists have recognized twenty-two races of the Peregrine Falcon. The three North American subspecies vary considerably in appearance and are described individually below. The Tundra Peregrine is the palest of the North American subspecies, and also is slightly smaller than the others. Adults have an almost unmarked white breast, and relatively light barring across their mostly white belly. Their back is slate-coloured with bluish-gray tinges, and may take on a silvery appearance, especially lower on the back. The moustache on Tundra Peregrines is very narrow, and the white auricular patch (the area behind the moustache) is large. Juveniles often have a pale buff or whitish crown and forehead, and have a pale superciliary line (over and behind the eye). Their breast is finely streaked, with a cream-coloured background. The brown back feathers have wide buffy edges to them. The Anatum Peregrine is intermediate in terms of colour and size. It often has a salmon or peach-tinged breast, with stronger barring across the breast than the Tundra subspecies. The back is slightly darker than in the Tundra Peregrine, but still has bluish-gray tinges, especially on the upperwing coverts and uppertail coverts. The moustache on the Anatum Peregrine is very wide, and the auricular patch is often very small. Juveniles have a solid brown crown and forehead, and have a fairly wide moustache, although their auricular patch is often larger than that of adults. They have heavy brown streaks on their cream coloured breast and belly, and have small buffy edges to the feathers on their back. The Peale's Peregrine is the largest and darkest of the North American subspecies. Adults have dark dense barring across the belly, and even to some degree over the breast. The moustache is narrower than that of the Anatum, but wider than that of the Tundra, and unlike the other subspecies, the Peale's has dark streaking in the auricular patch. Juveniles have very broad dark streaking on their breast and belly, making their underparts appear almost solid dark. Their back is a dark brown-gray, and the feathers usually have no buffy edges. The Peregrine has a harsh resounding "kak-kak-kak-kak" call. Both sexes give the same call, but males tend to sound somewhat wheezy and high-pitched, while females are more grating and coarse sounding. This call is usually given as a response to disturbance. A much softer "ee-chup" vocalizaton is given during courtship, and when birds are together at the nest. Young Peregrines have a higher pitched, more whiny quality to their call, and often vocalize persistently, especially when trying to attract an adult's attention. A Peregrine in steady flight has shallow but powerful wingstrokes, similar to that of a Cormorant. When in active pursuit, the wingstrokes become deeper. When Peregrines soar, they hold their wings flat and fan out their tail fully, making it appear diamond-shaped. While soaring, their wings are fully extended, and the wingtips appear broad and rounded, in contrast to their normally sharp-pointed appearance. In a dive (known as a stoop) the wings are folded in close to the body. Many Peregrine Falcons have leg bands, which allows individual birds to be recognized. This makes it possible to track the movements of individuals and gain valuable knowledge about their migratory routes and dispersal patterns. It also enables researchers to analyze the bloodlines of individual birds if the identity and history of both parents is known. As a result, it is possible to detect whether inbreeding is occurring in populations, and whether subspecies are hybridizing. On each band there are two characters, one above the other, which are large enough to be read with a telescope trained on a perched bird. Characters used are letters and numbers, and may either be vertical or tipped 90 degrees to the left. Some bands also have a one millimetre thick white band separating the two characters. If you see a Peregrine with a leg band, and can read the information on it, please report the exact code (including which leg the band is on, colour of the band, position of the characters, presence or absence of a white line). Send this information, along with the date and location of your sighting, to either the Canadian Peregrine Foundation, or the nearest (in Canada) Ministry of Natural Resources or (in the USA) Fish and Wildlife office.